I wrote about this salad a few years ago but has since been modified. 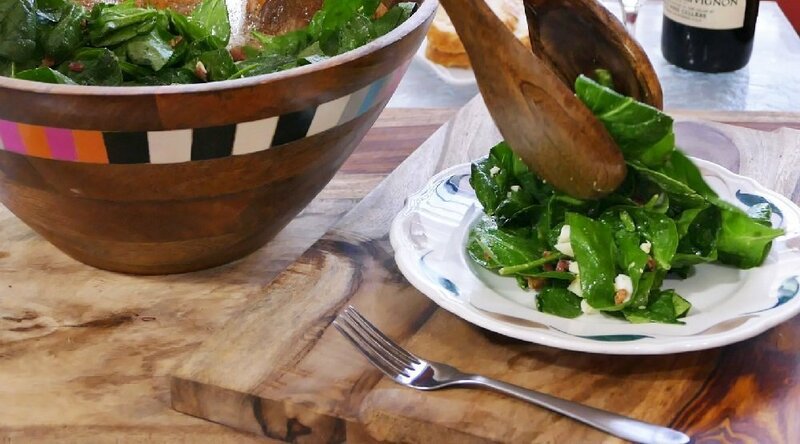 It was a famous spinach salad that gave national notoriety to a fine dining establishment in the Lake Tahoe area named Lancer’s. After retiring from her own Italian restaurant on the other side of the Lake, my chef Mom pleaded with the Lancer’s chef to share some of the secrets to this memorable salad. She tried. And tried. And tried. In fact, Momma tried for about 20 years with each conversation ending the same way—NO! Then one day, sadly, Lancer’s Restaurant burnt to the ground. (I promise my Mom had nothing to do with it!) But, through perseverance and a little help from a friend of a friend of a friend of the chef’s, Momma finally got the recipe she’d waited so long to toss for herself—the original recipe for Lancer’s Salad! Since then, more secrets have been revealed about preparation for the salad, which I’ve added in this column including rubbing the wooden salad bowl with a smashed clove of garlic to infuse the entire salad with more flavor. Also, the raw eggs have been replaced with 2 hard boiled eggs, which actually make the salad taste even better in my opinion! Finally, I’ve included my favorite tip for making sure the delicate leaves of spinach don’t get soggy when tossing! Now, you’re ready to serve tableside just like the maître d’ did at Lancer’s. This salad is perfect for everyday and of course, for the upcoming holidays. Here’s to great greens and even better kitchen stories! In a medium bowl, whisk together olive oil, brown sugar, lemon juice, mustard and Worcestershire sauce until well blended. Set aside. Coat the sides and bottom of a large wooden bowl with garlic, then discard garlic piece. (If you don’t have a wooden bowl, mince the garlic clove and add it to the salad mixture.) Add spinach, crisp bacon, eggs, salt and pepper to the bowl. Drizzle dressing AROUND THE SIDES OF THE BOWL (so spinach doesn't get soggy) then gently mix. Serve on chilled salad plates and top with egg and spinach for garnish.